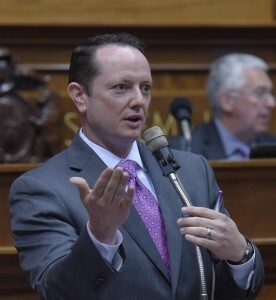 State Representative Eric Burlison (R-Springfield), who’s a delegate at the GOP National Convention in Cleveland this week, wants presidential candidate Donald Trump to stop using a script when addressing Americans. “I know that with people in politics, the tradition is to be careful and don’t say things that might get you tripped up. I really think that at some point, he just needs to smash the teleprompter and speak from the heart,” says Burlison. Burlison says protests in Cleveland are not as prevalent as Americans might think. “What I realized is that those things that happen are so isolated and few but they end up becoming the news story,” says Burlison. Burlison is the sponsor of constitutional carry legislation. The four-term Representative originally backed Texas Senator Ted Cruz for president. He says there are many similarities between Cruz and Trump. “They understand just how upset the American people are, for not just change, but bold leadership, people that are willing to do what America needs and say not what Americans want to hear but what we need to hear,” says Burlison. He is one of about a dozen Missouri legislators who are delegates in the convention, which ends Thursday.